BPLF 06-M10 6mm OD tubing to M10 thread female elbow brass to connect fitting connects a 6mm tubing to a male M10x1.0 threaded connection at a 90-degree angle. 6mm OD tubing to M10 thread female 90-degree elbow brass push to connect fitting has a a 6mm push-to-connect tube connection on one end and a female M10x1.0 threads on the other end for connecting to male threaded pipes. 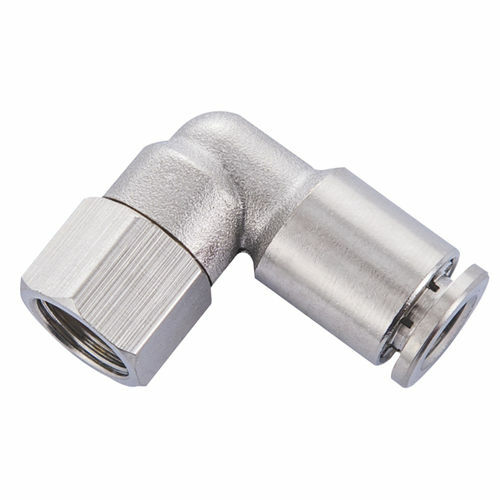 6mm OD tubing to M10 thread brass push to connect fitting female 90-degree elbow is made of nickel-plated brass for durability and corrosion resistance, and withstand high pressure, impulse, vibration, vacuums, temperature, pull out and burst pressure. Brass push to connect fittings are an excellent alternative to those made of plastic materials. Brass push to connect fittings female elbows are used in various applications, including machine tools, airplane and truck controls, and automated production lines, among others.